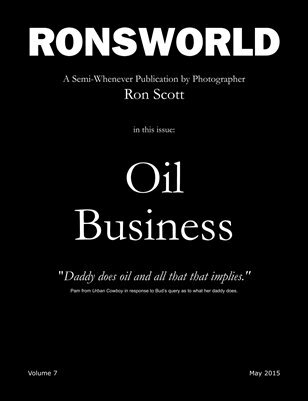 This issue features a selection of photographs Ron shot for the oil and gas business during his 40 plus year career as a Houston based photographer. The energy business (as we now call it) has always been a big part of the Texas economy, especially in Houston, which is known as the Energy Capital of the world. Among Ron's clients are major energy companies including Anadarko, Apache, Chevron, Conoco, Exxon, Gulf, Mobil, Pennzoil, Shell and Texaco as well as oil field service companies such as Baker Hughes, BJ Services, Cameron, Halliburton, Schlumberger and Welltech.